I just wanted to wish everyone in the US a Happy Thanksgiving and to give a quick blog update…I finally had the chance to put the finishing touches on my briefcase showdown review and I will be posting it this weekend. This review will hopefully help to answer the most frequently asked question in the Filson universe…which briefcase should I buy? Which one is which? (Please excuse my ignorance; I’m a Filson noob). Sorry for the confusion:) The 256 Original Briefcase is the thinner, green bag on the right and the 257 Computer Briefcase is the thicker, tan bag on the left. Stay tuned for the full review and welcome aboard. Can’t wait to read your review. I am thinking about getting 256 or 257 for myself – I am a girl! Do you think it will suit a girl? I am a photographer, love classic style, am a bit of a tomboy, but wear long hair. Help! And i want to get a green one. I was just planning on buying the 232 but now this teaser has me thinking, “I need a 256/257 too!” Will your review be out within the next week? I ask because I’ve found a few places doing sales and would love to know which bag would better suit my needs before the sales end. Too bad I missed the 25% deal but Joe’s sale is still quite good. I honestly don’t have an intended use in mind for the briefcase just yet. I’m getting the 232 as an everyday carry for a wallet, keys, water bottle, small notebook and maybe a few other small items. I saw a 230 in person and actually realized that it would hold all my everyday carry items sufficiently but I figure I would get a larger size in case I need more room for other things. Now that I think about it maybe getting a 230 and a briefcase would be better than getting a 232 and a briefcase. 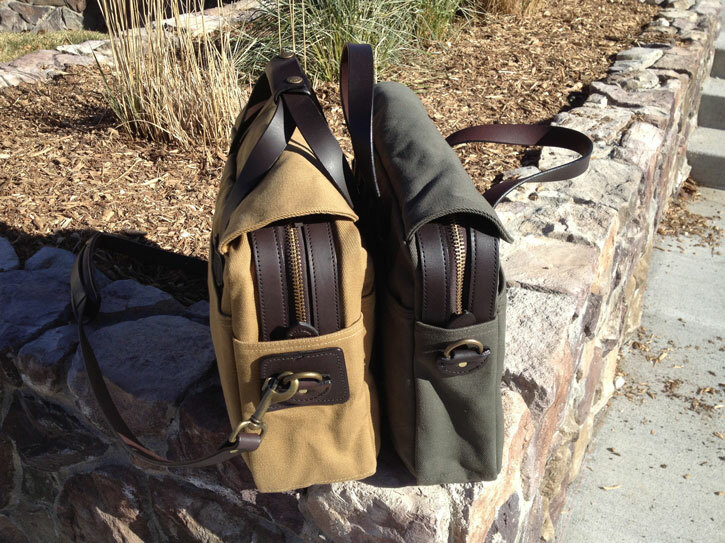 Well, at least I’ve decided on some colours: green for the field bag and tan for the briefcase. Sounds like a great plan. Keep me posted and let me know if you have any other questions. Hello. I just purchased a tan 256 as well and am really looking forward to it. I was thinking about whether or not to have the hand grip installed although this could take a few weeks. I plan to mostly carry it using the handles rather than using the shoulder strap. I normally don’t carry a laptop, mostly a binder and some books, etc. Do you think it looks better with the original handles or with a hand grip installed? Thanks! Thanks for visiting the site! Congratulations on the new 256; it is a fantastic bag. The hand grip question is a very subjective thing. It seems that most people do prefer it, but I happen to be in the minority that prefers the 256 with bare handles. The hand grip does allow the bag to handle slightly heavier loads and also keeps the two handles together when you set the bag down or are carrying on the shoulder. However, if you aren’t weighing the bag down too much, I find the bare handles to allow quicker access and to carry very comfortably. On the 257, the handle is a nice feature simply due to the fact that the bag is quite a bit larger and I tend to pack it heavier. My recommendation would be to use your new 256 for a few weeks with your normal load out and then assess whether you think the handle would be a good fit for you. Is it ready to use right out of the bag or do I have to treat the leather? I do have some neutral shoe wax/polish for my leather shoes. How often do you have to treat the leather if you use the bag everyday for work? Thanks for the tips. However, I live abroad so it will be hard to find those products specifically. I’ll probably have to use some of the shoe wax, perhaps a little bit at first to see how it is. It has a strong mink oil smell though. I managed to get a great Black Friday deal on the Filson page. 30% off the Original Briefcase. I purchased it for $157. I think I may have gotten lucky because I think the offer extends to selected items only. I asked them directly though and they applied the discount towards the briefcase too. Needless to say, I was ecstatic! 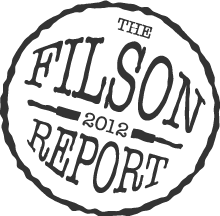 As I am new to the Filson name this review really helped me. I was looking on the Brooks Brothers site and noticed they sell Filson briefcases. I contacted Brooks Brothers to see if the models they sell are identical to the 256/257 on the Filson site since Brooks Brothers uses different item numbers. They actually could not give me an answer. Do you have any idea if they are the same or have they been altered for Brooks Brothers? Thank you. Thanks for visiting the site…yes, the models currently being offered by Brooks Brothers are the exact same as the 256/257 that you would buy directly from Filson. Unless you have a gift card for Brooks Brothers, or are buying it as part of a larger Brooks Brothers order (to consolidate shipping costs) or unless Brooks Brothers is offering a sale, I order directly from Filson. My logic is that on the off chance you find something wrong with your bag upon arrival, it is much easier to deal directly with Filson for exchanges or warranty work, than it would be to deal with a third party.